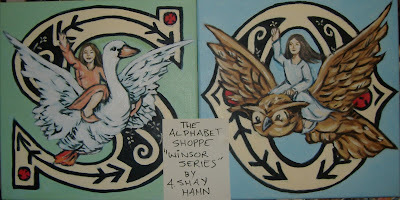 Wow, people are going crazy for the Winsor series, here is S is for Swan Rider and O is for Owl Rider, with a girl riding the Owl this time, yes this is entirely possible, all you have to do is ask. Very busy down at the Cameron House with my show, "Come On Pilgrim" you can read about it at the other blog, "the mad craft shoppe",see links over on the right hand side. This is a very busy month, so get in touch with me now for orders for letters or appointments to meet at the Cameron House, which I do once a week. This week it's Thursday from 5-7 pm.